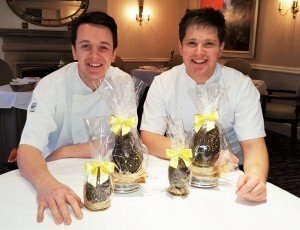 Kris Biggs, Head Pastry Chef in Richard Picard-Edwards’ Michelin-starred team at Lords of the Manor in the Cotswolds passes on some tips, some history and a recipe for this traditional favourite. 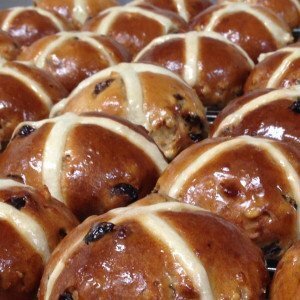 A hot cross (bun) is a spiced, sticky glazed sweet bun made with sultanas. It was traditionally marked with a cross on the top and eaten on Good Friday to mark the end of Lent. The cross represents the Crucifixion and the spices are there to remind Christians of the spices put on the body of Jesus. The traditional method for making the cross on top of the bun is to use shortcrust pastry; however, more recently recipes have recommended a paste consisting of flour and water. Pastry is very much about science, if you don’t have the correct measurements you might end up not having the best results. I’m a firm believer in the use of electronic scales as these are the best for accuracy. To produce the perfect round bun, when you portion each bun pinch each side quickly and pull into the centre. This traps the air and tightens the dough. (see photo) This helps to make an even roll. 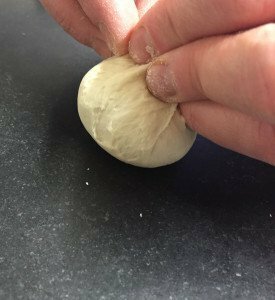 Once you’ve portioned all the dough, roll each into a smooth bun. The saying goes, ‘you eat with your eyes first.’ To produce the best looking hot cross bun, an even colour is important. As you see in my recipe, I turn the tray during cooking which gives an even colour, it’s also important to glaze your buns as soon as they’re out of the oven. Step 6 – At the end of the proving time, make a flour mixture (for the cross) by mixing together 75g of plain flour and 75g of water. Mix until a smooth paste then transfer the mixture into a piping bag, then pipe the crosses over the buns. Step 7 – Bake at 190˚C for 6 minutes then turn & bake for another 6 minutes. Step 8 – Glaze with the apricot jam.